As an addition to the Quality Control Module, you may acquire the Infection/Hygiene Control Module. This module is based on the Danish Standard of DS2451-10 for control of infection hygiene in the health sector. All the room types of the standard, with risk factors and risk hazard degrees for each critical risk point, are embedded in this module, leaving you to merely concentrate on the running of the actual room inspections. 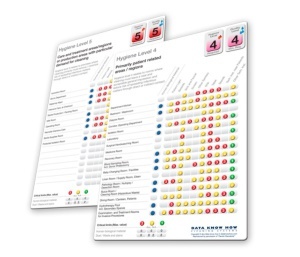 This module will tell you which risk points you need to check, and will, upon the conclusion of your inspection, tell you whether all risk points actually meet the risk hazard degrees recommended. You may thus make sure that the cleaning will actually meet the strict requirements made by the health sector to minimize the risk of spreading pathogenic bacteria in these environments. While inspecting the risk points, you may, of course, run inspection of the general cleaning quality, to the principles of INSTA 800, or going by check points of your own. The rooms may be printed on paper with a keying form for each room, or transferred electronically to The Cleaning System quality control program, IDEX, for Android smartphones and iPhones. Applying the Infection/Hygiene Control Module will provide an effective and quick check on cleaning tasks performed. RANDOM SAMPLING PLANS Creating random sampling plans based on information on required levels of hygiene in each room to be checked. The system itself will calculate the necessary number of random samples and the number of rooms in each particular random sample. INSPECTIONS Random sampling of the rooms to be checked. Transfer of selected rooms to Android smartphones and iPhones. Collection of data for evaluation of the level of hygiene of each particular room. Evaluation of whether the total infection hygiene of a random sample meets the requirements agreed. REPORTS Printout of reports for internal and external use following conclusion of quality evaluation.